I love pretty much anything with cheese in it but most traditional lasagnas are often just too much for me. Not because of the cheese, necessarily, but because of the heft. (Heft may not be a culinary term but it works here.) 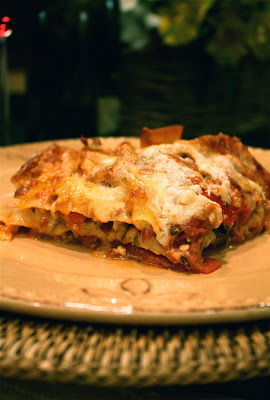 So many traditional lasagnas are so filling and noodle-laden that I often can't have more than just a few bites. I know many people love those mile-high, thick-curly-noodle, ricotta-oozing, meat-based lasagnas...I can't fault them...some are delicious...but this little number now has my vote when it comes to lasagna. The ones I located (they're right with all the other pastas...just never looked before) are "no-boil," which just makes this whole process that much easier. No need for boiling those masses of thick lasagna noodles, burning your fingers trying to keep them separated and in one piece. These "sheets" make nice thin layers of noodle, just enough pasta to stack beautifully and meld with all the other flavors without taking over the whole show. And, surprisingly, this lasagna comes together very easy. It's basically just three simple steps to getting it ready to pop in the oven. ...then pop them in a 400 degree Fahrenheit oven for about 15 minutes. Keep an eye on them. You want them slightly roasted, not broiled or too brown. While they are doing their thing, you can prep your sauce. It's basically the same easy sauce I used for my turkey meatballs. I start by putting just a little sauce down into my baking dish (I think this just helps to keep the noodles from sticking). Then a layer of noodles, a layer of veggies, a full ladle or two of sauce, a layer of all three cheeses (lightly sprinkle mozzarella and parmesan...and just dot some of the mascarpone randomly throughout). Then...another complete layer. Then a final layer using just noodles, sauce and cheese (no veggies). Cover your dish with foil and bake for 30 minutes. Then uncover and bake another 15 to 20 minutes. 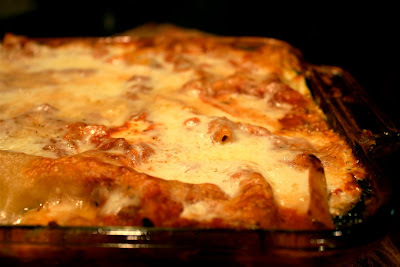 This dish truly has all the great qualities of lasagna...ooey-gooey goodness without all the...well...heft. 1. Cut and prep your veggies for roasting. 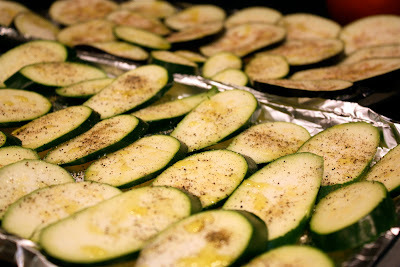 Lay veggies on foil-lined baking sheets, drizzle generously with olive oil, salt, and pepper. Place in 400 degree Fahrenheit oven to roast for approximately 15 minutes. Keep an eye on them to avoid over-roasting. Once done, remove from oven and set aside. 2. 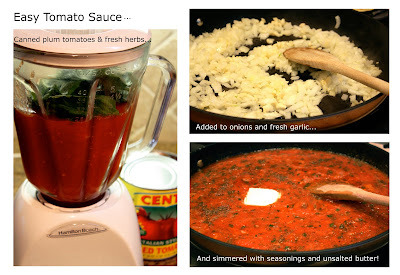 Prep sauce by pureeing canned tomatoes and fresh basil in a blender. Add olive oil to a large skillet over medium-high heat. Add diced onion and garlic to skillet. Saute for about 2 to 3 minutes, just until onion is soft. Reduce heat (to avoid splatter) and add blended tomatoes, italian seasoning, basil, salt and pepper. Taste and adjust seasonings to your liking. Simmer sauce over low heat for about 15 minutes, just to thicken a bit and allow flavors to meld. 3. 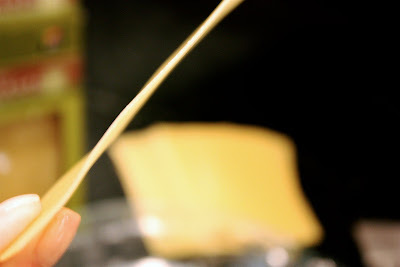 Add some hot water to a shallow glass dish and place a few noodles into water to reconstitute them just a bit. 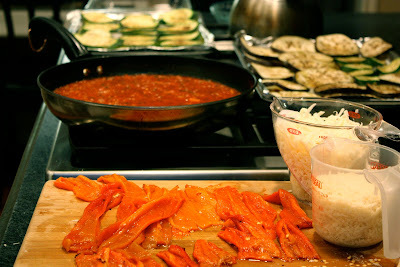 Prep cheeses and arrange ingredients on counter and/or cooking surface to allow for quick assembly. Put a ladle of sauce down into baking dish (to keep noodles from sticking). Arrange a single layer of noodles (no overlapping) on top of sauce, and continue layering veggies (single mixed layer without too much overlapping), sauce (about 2 ladles or so), and cheese (lightly sprinkle shredded cheeses and just dot mascarpone). Continue with another complete layer, beginning with noodles. 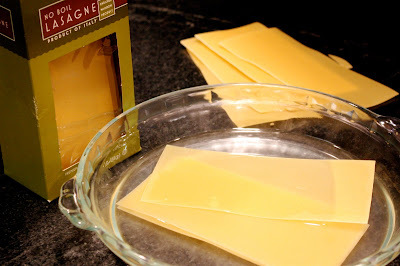 For the final layer, arrange noodles followed by sauce and cheese (no veggies) to just cap your lasagna. 4. Cover lasagna with foil and bake in a 375 degree Fahrenheit oven for 30 minutes. Remove foil and continue baking (uncovered) for another 15 to 20 minutes, until just golden brown and bubbling. Note: This easy sauce is like the one I used for the Turkey Meatballs a few weeks back. Since I was overly zealous in layering this particular lasagna, and used my portion up before my final layer, I whirred up another 14-ounce can of tomatoes with some pre-made pesto (to just give it some oomph since it wouldn't get any simmering time) and used a portion of this to finish up my lasagna. With those meatballs I mentioned, I made up another whole batch of sauce on Day Two since we'd pretty much polished off all the sauce on Day One. The point here: just improvise and it all works out.